The leader in innovative Linear & Rotary Actuator technologies. Exlar has patented actuator technology that provides several benefits over traditional linear products. Exlar Roller Screws are designed so that positioning can be obtained very easily via an electrical/mechanical fusion that is unmatched in the industry. They can last many times longer than ball screws and acme screws due to the robust Roller Screw design. Exlar's Roller Screw technology also has many advantages over hydraulic and pneumatic actuators as well. 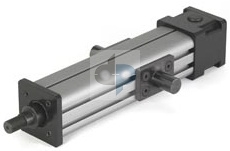 They provide over 90% efficiency, easy positioning, high speeds, low friction, and minimum space requirements, that simply can not be obtained with a pneumatic or hydraulic actuator.